PADI Specialty Instructor Training courses teach instructor candidates how to organise, promote and conduct PADI Specialty Diver courses. 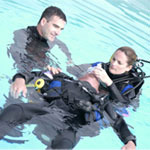 These courses emphasise the importance of Specialty Diver training within the PADI system of diver education and provide hands on experience of the skills and equipment involved along with invaluable tips and techniques for successfully conducting the courses. Dive more, have more fun and teach about your favorite subjects. Most of the courses involve a small academic component which is carried out at our dive training facility with the majority of the work being done during open water sessions. For the non diving courses all of the work is done at the dive centre. Teach the PADI Specialties you like most !